Are you stuck trying to write a novel? Have you tried writing several stories, only to stall out in the middle and move on to a new project? 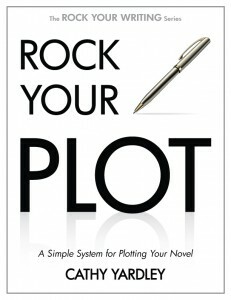 Do you like the idea of plot outlines, but have difficulty figuring out what happens next, or what should happen where? Or are you a writer who hates outlining, preferring to write a novel organically– but still feel like your story needs more plot and structure? Outlining, whether it’s just the turning points or a comprehensive scene by scene plot outline, might help you get past your block. – Premise: test your premise for inherent conflict and sustainability. – Characterization: create strong characters with urgent goals, understandable motivation, and tons of obstacles. – Plot outline, turning points: use those characters to build logical and powerful plot points and complete character arcs. – Plot outline, scene-by-scene: Develop a sequence of dynamic scenes that propels your reader through your story. This book goes straight to the point, putting theory in plain language, adding examples from blockbuster stories, and finishing each section with exercises designed to help you work with your characters to write a novel that excites you… and your readers.